Having a funeral service helps the family acknowledge the reality that a dearly loved one has departed. It also encourages them to remember and honor the deceased by sharing unique memories with others, hence bringing people together in an atmosphere of love and support. Ultimately, it allows everyone to embrace and reflect on the meaning of life and death. In order to inform the attendees what to expect in the ceremony, a funeral church program is needed, detailing the sequence or order of the funeral service. 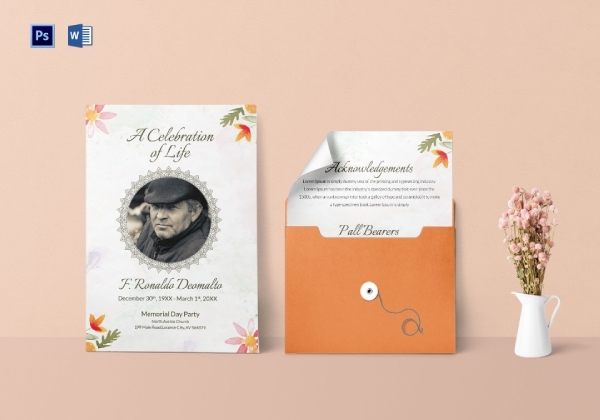 Creating a program is burdensome for the grieving family, so to help you achieve your desired design in just a few clicks and provide you ideas on creating a funeral church program, the templates and examples below can surely help. Getting stressed with the responsibilities regarding the funeral being piled up? Through this template, we hope that we somehow helped you lighten your burden for this is very convenient to use and easy to edit. You may choose between the file formats available—Photoshop and MS Word—depending on what computer software application or tool is easy for you to use. Professionally crafted by designers, you will be assured of great design and high-quality graphics. 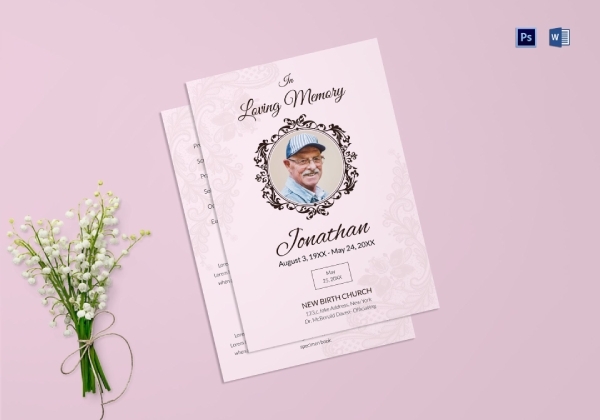 Moreover, you have the freedom to incorporate and personalize the details for the funeral service and to adjust the design elements until you will be content with the overall appearance of the program. With this funeral church service program template, you will easily get to inform the family and friends of the deceased as well as other important people by incorporating the essential elements that must be present in a funeral program which are as follows: complete name of the deceased, date of birth, date of death, location of the funeral service, date and time of the funeral service, order of service, acknowledgment, and contact number of the person creating the program in case the guests and attendees have concerns and question related to the funeral. The photo on the front is optional, but you can include the photo of the deceased, religious images, or beautiful scenery or view. The final decision is yours, so take time to contemplate on what photo would you want to include. We know creating a funeral or memorial program during this time of sorrow is tough, but you have to be tougher so you can provide your guests with a funeral order of service which contains, apart from the basic elements, important details as regards the funeral. You can also include a short obituary of the departed loved one and a thank-you note for the attendees of the funeral and for those people who showed moral and financial support. Hence, in this program template, you are guaranteed not only with great and excellent designs but also with useful content that will serve you as a guide in your program creation. You can also edit the design elements according to your heart’s desire and current preferences. Because death is inevitable, even celebrities cannot escape. When this time comes, the family of the deceased must prepare the funeral program to inform not only the relatives and friends of the departed loved one but also the avid fans and supporters so they can attend the funeral service or show financial and moral support. When the service will be held in the funeral home, the address must be specified in the program. Moreover, you must not forget to include the date and time of the service. You can use this celebrity church funeral program for an easy download, edit, and print. 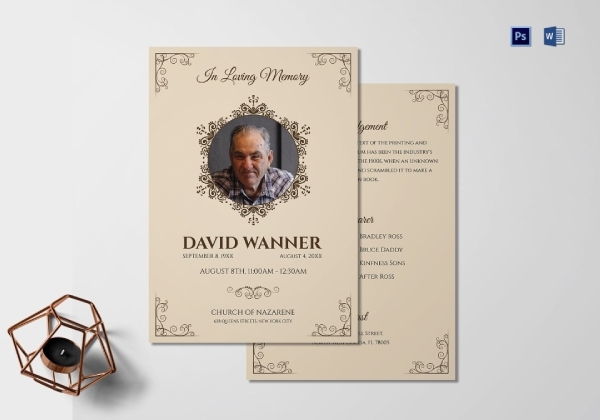 The background and border designs are optional, but if you want to present the best tribute for the deceased, choose the best design for your funeral program. Been busy for the funeral arrangements and preparations? Get your desired funeral church program design in just a snap. 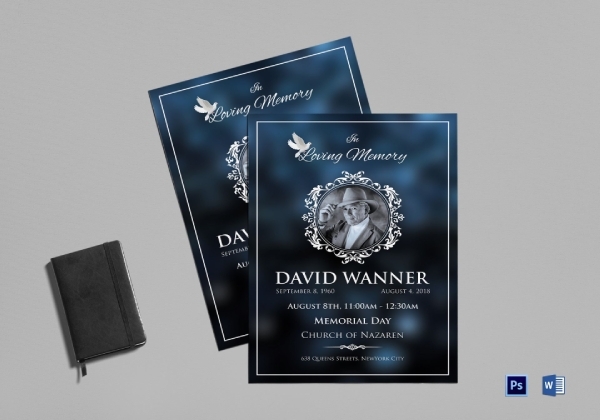 With this classic funeral church program, you can easily achieve the best design that you want in just a few minutes. You can also immediately download and print the file at home at your local printing shops. 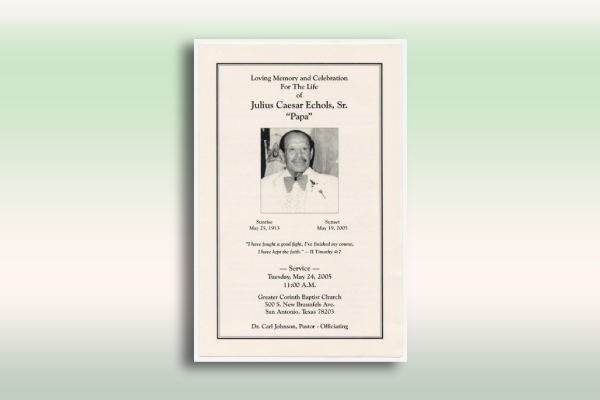 Apart from providing a list of the order of the service, some attendees would keep the program as a memorable keepsake of the funeral of the deceased. 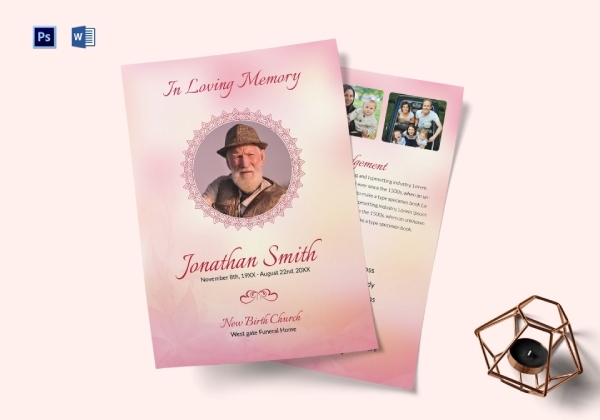 Now that you know the importance of a funeral program, put your best foot forward in creating a program through the use of this easily customizable funeral or memorial program. In this vintage funeral church program example, the following elements in a program are present: the name of the deceased, date of birth, date of death, Bible verse, date and time of the service, location of the funeral service, and officiating pastor. You can also observe the minimalist border made of simple black lines. This might just be a simple funeral program, but the heart of those people who are working hard in making this program would also matter. 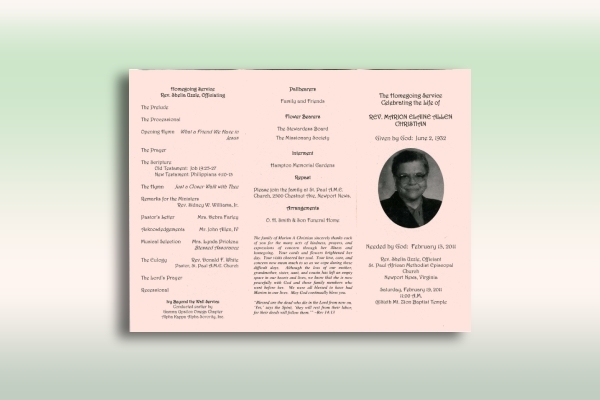 When you need to incorporate a lot of details for the funeral church program that you are creating, it is fitting and proper to use the trifold format for your paper to accommodate such information. Just like in this trifold funeral church program example, all the important details are included in the single sheet. The important information as regards the funeral are the following: the details of the deceased such as the name and dates of birth and death, the order of service, funeral home, time and date of the repast, officiating pastor or priest, and a short thank-you message for those who sympathize the family.